A Pennsylvania adoptee search for birth parents usually requires more research beyond obtaining the original birth certificate, a version of which is available to adoptees. The Non Certified Copy of Original Birth Certificate lists the child’s name, the birth mother’s full name, the birth mother’s age and the birth father, if he’s named. The child may have been given the biological father’s surname, which is a pointer to who he might be even though his full name isn’t provided. 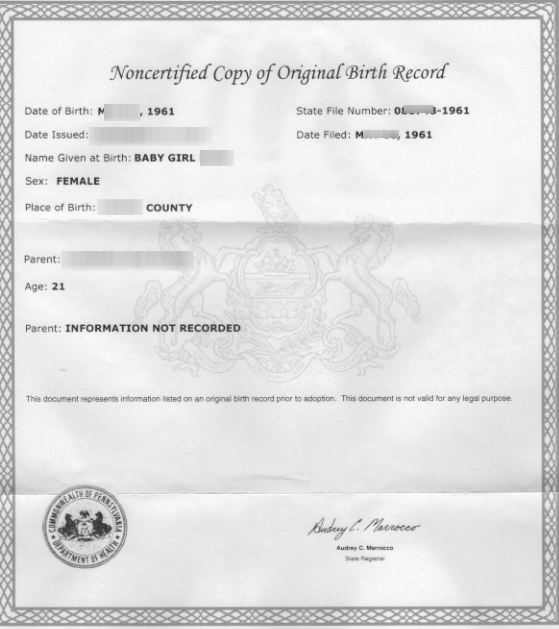 Simultaneous to ordering your original birth certificate, contact the Pennsylvania Adoption Information Registry and order the non identifying information file that profiles the bio families. The biographical record has the birth mother’s age and circumstances, her parents and siblings ages, their ethnicity, type of work and health, marital status and religion. That biographical information will increase the likelihood of locating the birth relatives. The Adoption Registry can note your consent to be identified to a birth family member should one contact them. Siblings and biological parents are authorized to request records, too. Use this form to order your court adoption file: Pennsylvania Adoption Information Registry Request for Adoption Information. Other forms and resources can be found at the Adoption Information Registry website. To obtain the birth certificate from the Division of Vital Records, submit the document titled, Adoptee’s Application for Noncertified Original Birth Certificate. Review the website page for instructions on payment and providing identification. While you’re waiting for the adoption records and birth certificate, which will take about a month to be processed, submit a DNA sample to a major testing lab to enhance your search outcome. Order a DNA test from Ancestry, if you’re going to do only one test. This company has the largest collection of test-takers and has an extensive database of genealogical records. Combined, those are persuasive reasons.